A super simple, super-delicious blue cheese sauce for pasta, delivering tons of flavor with just three ingredients: butter, blue cheese, and parsley. 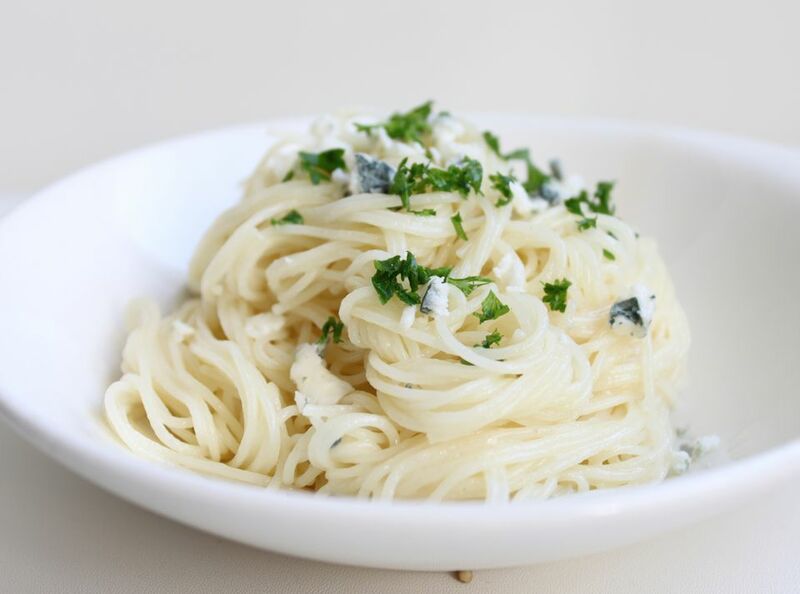 The soft texture of blue cheese means it melts completely into hot pasta, leaving behind its bold, salty flavor. For blue cheese sauce with the best flavor, use your favorite blue cheese in this recipe. Not sure what your favorite blue cheese is? Ask your local cheesemonger for a few samples, or try Gorgonzola, Cashel Blue, Buttermilk Blue, or Maytag Blue. Bring a pot of salted water to a boil and cook pasta according to package directions. Reserve 1/2 cup of the pasta water, then drain the noodles. Turn the heat down to low and add the butter to the pot. When the butter has melted, add the noodles back to the pot and stir to coat. Slowly add the blue cheese, stirring the noodles so the cheese melts. As you add the cheese, also drizzle a little of the reserved pasta water over the noodles, using as much or as little as needed. The water will keep the noodles from clumping together and thin out the blue cheese as it melts so the sauce has a lighter, less-sticky texture. Once the blue cheese has mostly melted, stir in the parsley. Add salt to taste. Serve immediately. Creamy and Buttery: Some types of blue cheese are so soft and creamy, that they can be spread across bread like butter. Often, the flavor of these super-soft blues is milder and you'll notice fewer blue veins throughout the cheese. One example of creamy and buttery blue cheese is Cambazola. Creamy and Crumbly: Still very creamy, these blue cheeses also have enough structure to be crumbled into large or small pieces. Roquefort is a good example of creamy, crumbly blue cheese. Creamy and Firm: These blue cheeses are firm enough to cut into wedges and the texture is slightly drier, which isn't to say that the cheese won't melt in your mouth when you take a bite. Stilton is a good example of a rich and creamy blue cheese that also has a firmer structure. Why Is Blue Cheese Blue? Most commonly, the type of molds used to make blue cheese is Penicillium Roqueforti and Penicillium Glaucum. Way back when, these molds were naturally present in cool, damp caves where cheesemakers aged wheels of cheese. These days, the bacteria are often purposefully introduced after the curds are ladled into containers to drain and form whole wheels of cheese. As for the "needling," wheels of blue cheese are pierced, either by hand or by a tool that can poke many tiny holes at once, to create tiny openings. Air enters the tiny holes, feeding the mold and encouraging the blue/green veins to form. What One Ingredient Do You Absolutely NEED to Make Hollandaise Sauce?